Still in catch up mode. Posting March 12 on March 14. Saturday March 12th we took the bus, using our new bus passes, to shop at the Intermarche grocery store. We took our wheeled cart for the first time this year. Sandy remembered the location of many items in the store making the shopping experience less difficult. Our frequent shopper/ fidelity card didn’t work because of inactivity. We walked to the Rocabey market to say hello to the flower vendor. He talked in English and Phil talked in French. We looked for small thermometers at the kitchen vendor, but didn’t find any. The notions vendor who sells sewing goods and yarns, only carries acrylic and wool yarn. To make potholders and dishcloths, Sandy needs cotton yarn. We’ll keep shopping for yarn. We headed to our apartment. Around 11:30 we walked to Divers’ Cite restaurant to make a reservation for dinner. Later, we walked to the restaurant at 19:55 for our 20:00 reservation. It was really nice to see Claudine and Yves again. He cooks and she serves. It is only the two of them and 9 tables. They added quite a few decorations to their restaurant since we last saw them in 2014. Sandy was very happy to see crab cakes on the menu as an entree/starter. Phil ordered them and we shared the crab cakes. They are delicious! 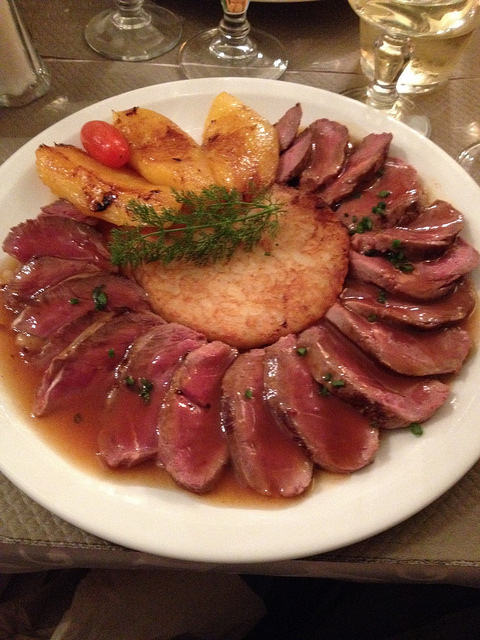 Phil ordered duck and Sandy ordered beef steak for plat/main dishes. Everything is beautifully presented and outstanding food. 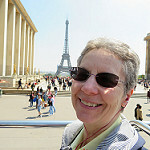 Sandy had Kougin Amann and Phil had chocolate profiteroles for dessert. We left the restaurant at 22:15. Time well spent. 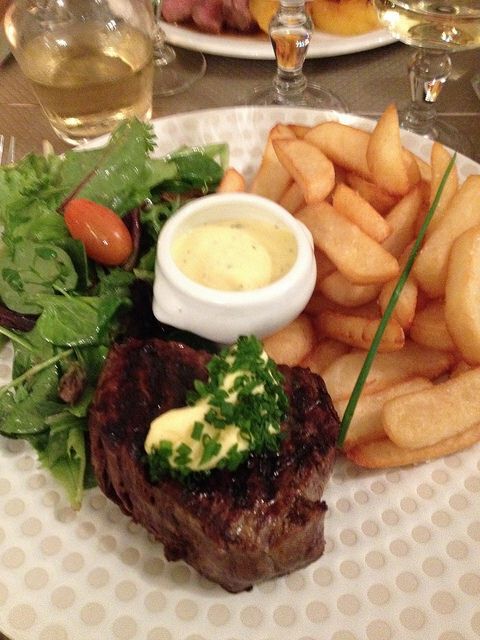 It’s our favorite place to eat in all of Saint-Malo! Thanks for the great pictures. I really enjoy my escapes from reality to your world. The other three choices were fish. I tried the duck and have never had it before. It was delicious!